These Farm Heroes level 435 cheats and tips will help you beat level 435 of Farm Heroes. 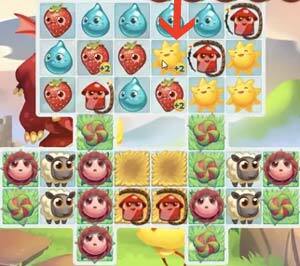 The objective of Farm Heroes level 435 is to reach 100% growth in 24 moves by collecting 4 sheep, 12 flowers, 140 suns, and 140 strawberries. Farm Heroes Saga level 435 presents some rather tricky and taxing challenges as there is a great amount of wrk to be done. Luckily, you have a few things going for you here. The first of which is the six firecrackers on the board. 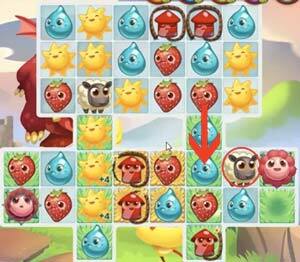 The first thing you should look to do in Farm Heroes Saga level 435 is to spark the firecrackers. To activate a firecracker you must create an adjacent match alongside a firecracker. When this happens, the firecracker will light. After several moves and times, the fire cracker will go off and send four flames out on to the board. These flames will then clear out whatever space they land. If a flame lands on a space with a flower, it will bloom a stage. Remember, to become more efficient, try and make the adjacent matches count towards your required cropsies needed to complete this level. That means making matches of red strawberries and yellow suns. Once you ignite the firecrackers and create some space, you should then focus on the flowers. This is especially true since they form a blockade around the sheep. To bloom a flower, you will need to create three adjacent matches alongside the flowers. As you do this it is very important that you conserve your moves by making the matches count towards your required cropsies of red strawberries and yellow suns. Since the flowers are next to each other, you will also have the opportunity to bloom multiple flowers at the same time. If you are stuck or in trouble, you can always use your shovel booster to speed up the flower blooming process. Don’t forget the shovel will not take up any of your moves. Level 435 Cheat #3: Move those sheep. 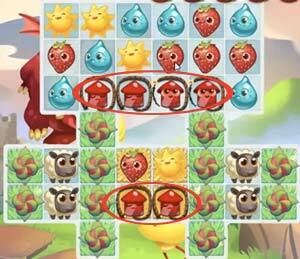 One of the most challenging tasks in any Farm Heroes Saga level is collecting sheep. To collect a sheep, you will need to heard the fluffy fella to the hay. In order to move a sheep, you need to make an adjacent match alongside of it. The sheep will then move to the space where the match was created. You will need to continue this process until your sheep reaches the hay. Therefore, the ending match should be made on a square of grass. Luckily for you, the hay is fairly close to the sheep. You should also note that all of the adjacent moves must be made by you and not by a cascade-like effect.